Are you a guitar fan? Have you ever visited this unique museum? It is situated about 200 metres from the centre, near to the Orthodox Church. 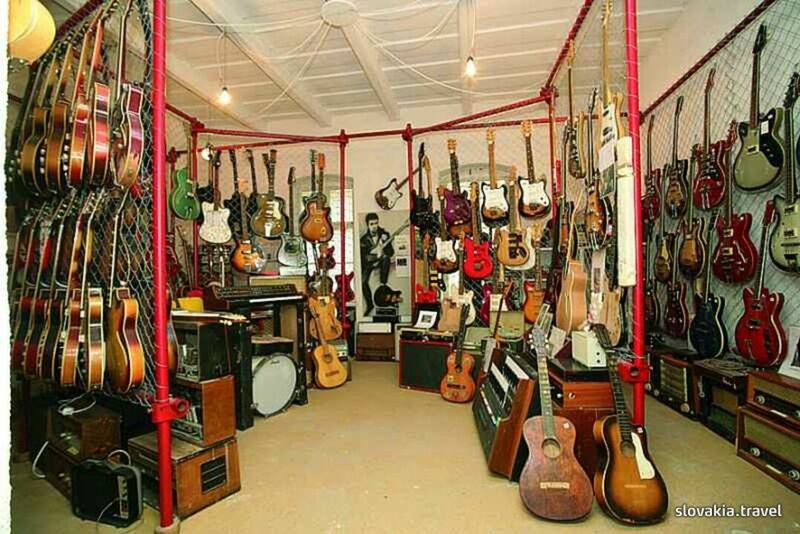 Its visitors can see almost complete collection of electronic guitars from the years 1947 to 1980. The Czech guitar Gracioso, which was used also by George Harisson at the beginning of his career, is probably the most valuable exhibit of the museum. Besides this, you can also find precious pieces which were donated to the museum by Petr Janda from the band Olympic, Maťo Ďurinda from Tublatanka and other Slovak music personalities. Besides the unique collection of guitars, visitors might be captivated also by a painting exhibition. Another attraction of this museum is certainly the complete documentation of beginnings, development and individual artistic stages of the legendary band Beatles, including commentary on the guitars this Liverpool quartet played in the time of its biggest popularity. Your visit to the town of Sobrance can be more interesting if you see another curiosity connected with the museum activities, the pottery workshop, where you can try working with clay. Do not hesitate and take a trip to Sobrance! Vstup do galérie je možný len na základe telefonickej rezervácie.